Handcrafted in Israel Mens rings jewelry cufflinks tieclips Mens wedding rings. Made in Israel mens rings in silver and gold or all silver jewelry - Israeli rings cufflinks tie clips. 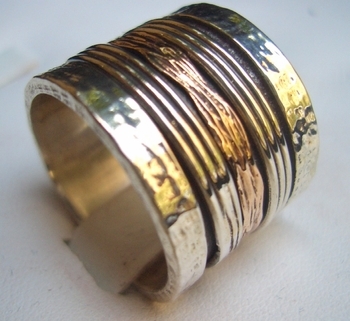 Unisex rings. Spinning rings. Meditation and swivel rings. Jewelry has been an integral part of human life in different forms. Since ancient times, jewelry has been used to enhance the charm and grace of both men and women. One of the most important jewelry items is the wedding band, which is made of different precious metals such as gold, platinum, white gold, silver and so on. Nowadays silver wedding bands are widely popular, as they come in several designs and patterns and are reasonably priced. Silver wedding bands are usually made of sterling silver, which is 92.5% of pure silver combined with approximately 7.5% of copper. Silver wedding bands are available in different width sizes. Silver wedding bands are popular among all sections of people on account of their affordability. Silver wedding bands available in different designs and display beautiful craftsmanship look beautiful and add to the charm of the occasion. Motion rings also known as spinning rings are fun enjoyable and mesmerizing to look at. The rings are constantly spinning on your hand creating a symphony of motion providing entertainment for yourself as well as your friends. These motion rings are precision engineered with a counter balance to create a smooth, fluid movement. Our Motion Rings are finely handcrafted in Israel. Ideal rings as engagement rings, love rings, designer rings. The designers imagination create these rings with an unusual blending of form, colour, touch and soul.